Sit on the floor. Stretch your legs out in front of you. Place your palms beside your hips with your fingers pointing forward. Lift your chest, straighten your arms, and keep your back strong and straight. 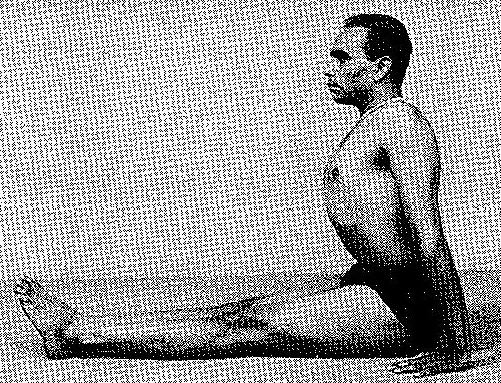 Iyengar's arms are relatively long when compared to the length of his torso. As a result, to keep his arms straight and plant his palms on the floor, his arms are further back than mine. Iyengar's toes are relaxed. I am spreading my toes wide and drawing my toes back as I press forward through the balls of my feet. I don't know whether Iyengar is lifting his chest much more than I am... or his chest is just enormous. We may never know.